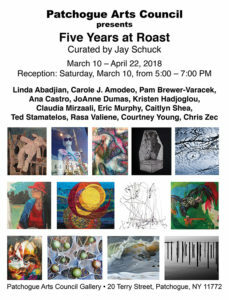 Five Years at Roast | Patchogue Arts Council, Inc. 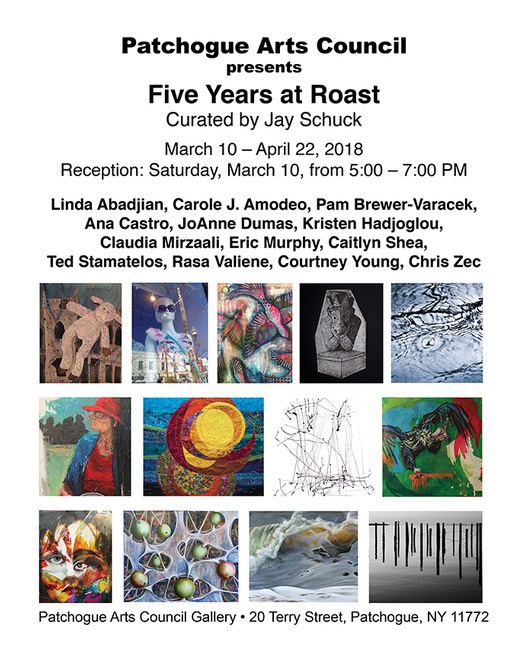 The Patchogue Arts Council is proud to present Five Years at Roast, a group exhibition featuring the artwork of Linda Abadjian, Carole J. Amodeo, Pam Brewer-Varacek, Ana Castro, JoAnne Dumas, Kristen Hadjoglou, Claudia Mirzaali, Eric Murphy, Caitlyn Shea, Ted Stamatelos, Rasa Valiene, Courtney Young, and Chris Zec. These select artists have shown their artwork at Roast Coffee & Tea Trading Co. between 2013 and 2018 and have been invited to celebrate PAC’s five-year anniversary of presenting artwork at Roast. The exhibition is curated by Jay Schuck and is on view at the Patchogue Arts Gallery from March 10 – April 22, 2018 with a reception on Saturday, March 10, from 5:00 – 7:00 PM. The reception is free and open to the public. In 2013 Roast Coffee & Tea Trading Company opened its walls to the Patchogue Arts Council, inviting PAC members to exhibit their artwork. Five years later, we celebrate the partnership of the Patchogue Arts Council and Roast Coffee & Tea Trading Company by inviting a selection of artists who exhibited at Roast to participate in this retrospective exhibition. In addition, a companion retrospective exhibition, Five Years Later: A Retrospective, featuring the artwork of Linda Abadjian, Carole J. Amodeo, Ana Castro, JoAnne Dumas, Kristen Hadjoglou, and Chris Zec is on view at Roast Coffee & Tea Trading Co. from March 10 – April 29, 2018 with a reception on March 10, from 4:00 – 5:00 PM. The reception is free and open to the public.